Tomatin has swept the board at the 2019 San Francisco World Spirit Competition, with seven Double Gold wins and four Gold awards. The latest victories cement a decade of success, with nearly 60 prestigious accolades across the board. Founded in 2000, the San Francisco World Spirit Competition recognises exceptional products in the spirits industry, with a judging panel made up of 40 industry experts who ‘blind’ taste-test all products to prevent brand reputation or bottling style from impacting on the final award given. Entries that receive the coveted ‘Double Gold’ award have been rated as ‘Gold’ by every judge on the panel. Scooping 11 awards of Gold or higher, our core range excelled with 4 Double Gold awards and 3 Gold awards, a new record for the core range. Our exclusive Tomatin Travel Retail range also came out on top, with 2 Double Gold wins and a Gold. Lastly, our 21 Year Old American Exclusive single malt, which was released last year, also scooped a Double Gold win. This year, we have received no less than seven Double Golds, with success reigning supreme for our Core Range. The range starts at entry level Tomatin Legacy (£30) and extends to the exquisite Tomatin 36 Year Old (£600); all products in the Core Range have been awarded Gold or Double Gold at this year’s awards. Over the past decade Tomatin have received 17 Double Gold, 24 Gold, 16 Silver and 2 Bronze medals. 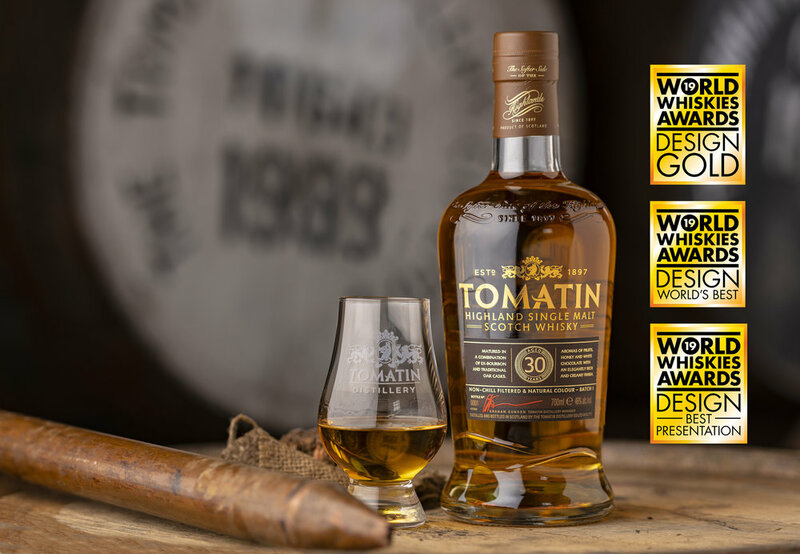 Tomatin 30 Year Old, our latest addition to the core range, was also awarded with ‘World’s Best Design’ at the World Whisky Awards held in London, this is our first dedicated ‘Design’ win at the prestigious ceremony. Over the past few years we have invested a lot of time in rediscovering our distillery, people and values and refining our business model to move away from the formerly lucrative bulk commodity market and focus on our core brands. In 2002 the number of stills was reduced to 12 and we are now comfortably producing just over 2 million litres of alcohol annually. Our strategy has been transformed and we are now producing some of the finest Scottish Single Malts in the world, and in turn promoting and growing the Tomatin brand in its own right.